The beginning of the end starts Monday, Febraury 19 (9:00 p.m. EST) when the critically-acclaimed animated series Star Wars Rebels returns to Disney XD with new episodes as the series nears its grand finale. The final episodes will unfold over three weeks, with two back-to-back episodes premiering every Monday night on Disney XD, until its epic 90-minute conclusion on Monday, March 5 (8:30 p.m. EST). The network released a new trailer and poster today, which reveals the return of Emperor Palpatine. 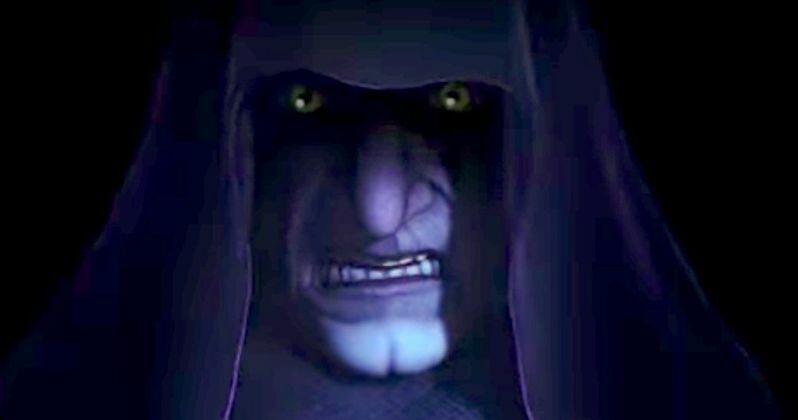 As teased in a new Star Wars Rebels trailer, Emperor Palpatine makes his series debut in these final episodes, voiced by actor Ian McDiarmid who reprises this iconic role from the "Star Wars" live-action films. The multi-platform schedule, in the U.S., for the remaining Star Wars Rebels episodes is as follows. On Monday, February 19, premiere telecasts of "Jedi Night" (9:00 p.m. EST) and "Dume" (9:30 p.m. EST) will debut on Disney XD and will be released on the DisneyNOW App at 10:00 p.m. EST. On Monday, February 26, premiere telecasts of "Wolves and a Door" (9:00 p.m. EST) and "A World Between Worlds" (9:30 p.m. EST) will air on Disney XD and will be released on the DisneyNOW App at 10:00 p.m. EST. The iconic series comes to a close on Monday, March 5, with premiere telecasts of "A Fool's Hope" (8:30 p.m. EST) and "Family Reunion - and Farewell" (9:00 p.m. EST) airing on Disney XD and will be released on the DisneyNOW App (www.DisneyNOW.com) at 10:00 p.m. EST. To avoid spoilers and allow fans to experience the episodes together during each telecast, new episodes will be available on VOD and digital platforms the day after their linear and DisneyNOW premieres. Viewers can also catch all previously-aired Star Wars Rebels episodes from season four on the DisneyNOW App. In this final season, the Ghost crew joins the growing Rebel Alliance, struggling to unite against the Galactic Empire. However, when a new Imperial threat arises on Lothal, Ezra leads the crew back to his home world to defeat the oppressive forces of the Empire under the command of cunning Grand Admiral Thrawn. Old friends are reunited and new alliances are forged as the series builds to its epic conclusion. The critically acclaimed series has carried a new era of beloved characters, exploring storylines that span the entire Star Wars offering of movies, television, and diverse media. Season four promises a whole new batch of excitement and revelation as the series draws closer to the events of Star Wars: A New Hope. Star Wars Rebels is created by Emmy Award-winning executive producer Dave Filoni (Star Wars: The Clone Wars), Academy Award nominee Simon Kinberg (X-Men: Days of Future Past) and Emmy Award nominee Carrie Beck. The Lucasfilm Animation production is executive produced by Filoni and Kinberg, and co-executive produced by Emmy nominee Henry Gilroy. The voice cast includes Freddie Prinze Jr. as Kanan, Vanessa Marshall as Hera, Steve Blum as Zeb, Tiya Sircar as Sabine, Taylor Gray as Ezra, Dee Bradley Baker as Captain Rex, David Oyelowo as Kallus, Mary Elizabeth McGlynn as Governor Pryce, Lars Mikkelsen as Grand Admiral Thrawn and Warwick Davis as Rukh. Follow @DisneyChannelPR and @StarWars for the latest news on #StarWarsRebels and check out StarWars.com for more exciting news on the series. Take a look at the official trailer below, courtesy of Star Wars YouTube.